The Gliese 581 system’s orbit compared to our own solar system. 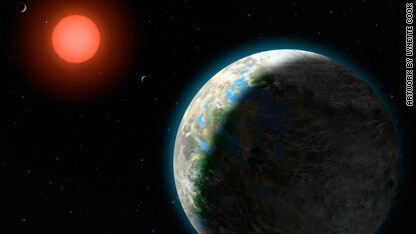 The planet labeled G is the one scientists believe could very likely support life. There are hundreds of known extrasolar planets that have been discovered in the Milky Way, but this is the first that could support life. Earthlings won’t be traveling to Gliese 581g any time soon unfortunately. Scientists say a spaceship traveling close to the speed of light would take 20 years to make this journey. But if we did – we’d find some other things familiar. The atmosphere and gravity are similar to Earth, and if you’re from the polar regions, you’d definitely feel right at home. Scientists say the highest average temperature is about -12 degrees Celcius (10 Fahrenheit), but they point out that the planet doesn’t have a night and day – one side continually faces the star and the other side faces the darkness of space. This means one side is blazing hot and the other freezing cold. “It’s not too hot, it’s not too cold, it’s just right” for water to form, Cunningham said. 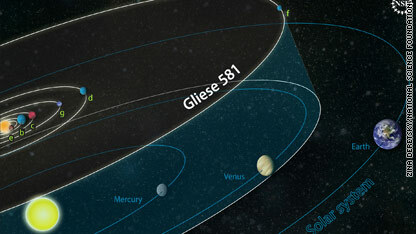 Other planets near Gliese 581g have been discovered, but they are not habitable and are mainly comprised of gas. Gliese 581g, however, is a rocky planet. It was discovered using the Keck telescope in Hawaii which has been observing the star Gliese 581 for 11 years. “Keck’s long-term observations of the wobble of nearby stars enabled the detection of this multi-planetary system,” said Mario R. Perez, Keck program scientist at NASA headquarters in Washington. Astronomers are excited this new planet was discovered so fast and relatively close by. Gliese 581g is in the constellation of Libra. While Earth takes 365 days to orbit our star, the sun, Gliese 581g orbits its star in 37 days.